Individuals do in fact process challenges, stressors and life difficulties with a therapist – but in sharing these truths, a client then puts in energy towards identify difficult patterns in their life, find new ways of coping, deepen their understanding of their family and relationships, and create new prospective. A good therapist certainly listens, but also helps to facilitate and guide an individual towards new insight and understanding. A lot of work, commitment, and energy are put into the therapy process on both sides. This is a very common and challenging myth that leads a lot of individuals to not gain the help and support of a therapist. While good support systems are essential, they do not replace the work of a therapist. Therapists are specially trained to help support emotional, behavioral, relational and mental health needs. Therapist can help individual’s process in a new way and teach skills to help the individual move forward. Further, the client-therapist relationship is non-reciprocal, meaning the client gets the full time to process, learn new skills, and focus rather than going “back and forth” with a peer. This is possibility a myth that is farthest from the truth. Going to therapy is a true, honest, and genuine sign of strength. Engaging in therapy means that the client has recognized the need for support, and taken a venerable step towards healing. Brene Brown, a researcher in the field of shame and resiliency, states, “Vulnerability sounds like truth and feels like courage. Truth and courage aren’t always comfortable, but they’re never weakness.” In essence, engaging in therapy is never a sign of weakness. Therapy is a unique and personal experience for every individual, couple, and family. At Symmetry Counseling, therapy is non-judgmental, confidential, supportive, and a place to process and grow. Though the work done in therapy can be hard, the outcomes are worthwhile. 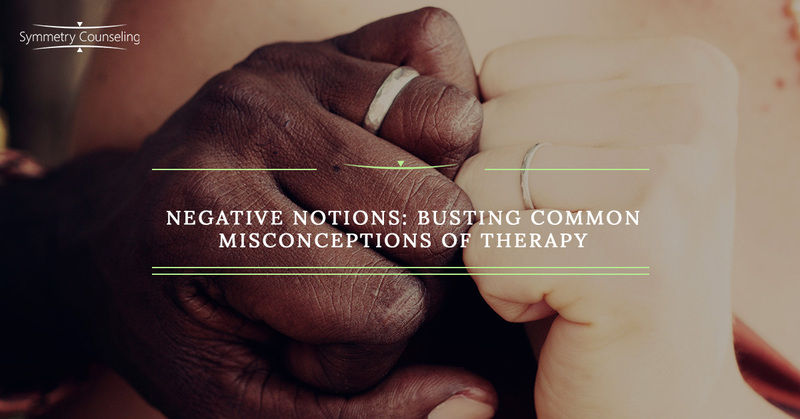 Place the negative notions of therapy aside, so the hope and healing can begin.